So Saturday was the annual Spring Fling festival in my community. A group I’m in had a bake sale which I had originally planned to bring cinnamon rolls to. Like many of my projects, I thought I had PLENTY of everything I needed to make my intended recipe. However, once I got home and got started I realized I only had about a teaspoon of cinnamon. 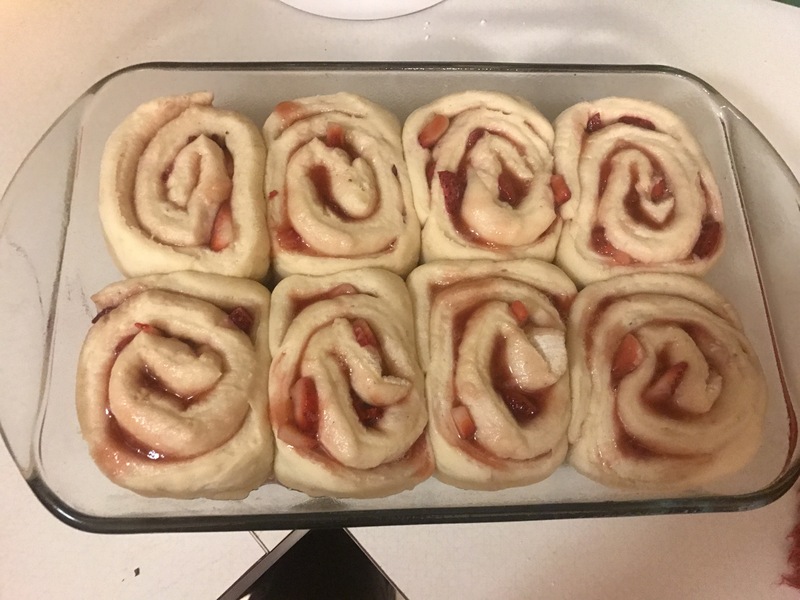 I followed my normal cinnamon roll/ bierox/ rolls/ everything that involves bread recipe (see below) then, instead of butter, cinnamon and sugar- I had a mixture of strawberry jelly, strawberry preserves, and strawberries. (I’m terrible at measuring so…I’ll get you as close as I can.) 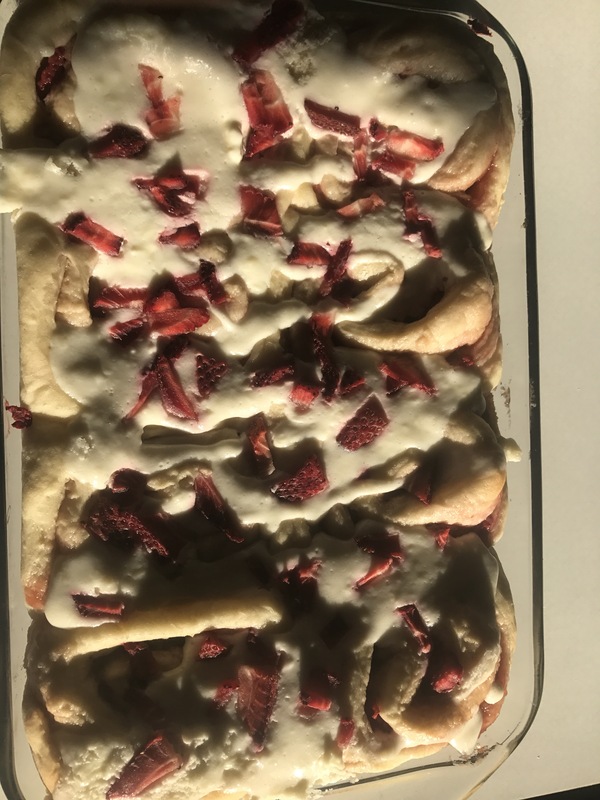 topped off with cream cheese icing and fresh strawberries. Mix sugar, milk and yeast together. Let sit for 5 minutes then mix in eggs, salt, and butter until well mixed, add flour one cup at a time up to 4 cups dough should be tacky, but not sticking to the edges of bowl. Add 1/8 cup flour until yay consistency is reached. Move dough from mixing bowl to a greased and lightly floured bowl and let rise for 1 hour. 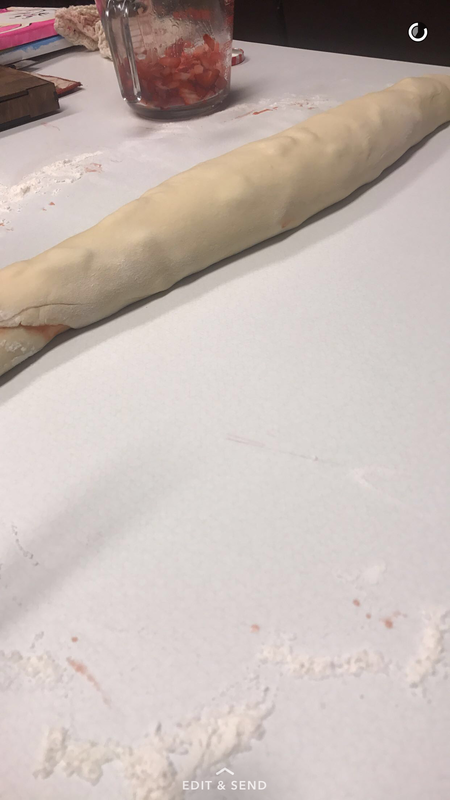 After dough has risen, place on lightly floured surface and kneed 4-6 times (do not kneed too much!) roll out, add filling, roll up and cut into 1.5 inch disks and place in 2 9×13 pans (will make 16 rolls) (I never do anything in perfect dozens) cover and let rise for 45 minutes. Bake for apx 10 minutes on 350 degrees F or until rolls are very, very lightly browned. Mix until smooth, pour in ziplock and cut a small corner off, drizzle over rolls. *rolls do freeze well. Once rolls are completely cooled, wrap individually in plastic wrap and freeze. To re-heat, place in microwave 25-30 seconds and serve!